I am not traditionally one for mixing sweet treats and “health food”. It always seemed like an oxymoron to me. Often healthy treats are laking in flavor and are just plain plain. If I am going to indulge on a treat, I want it to give me something back. I do love the rustic flavor of whole wheat, but if you bake with it traditionally, it can often give your recipe a heavy texture and weight. I found one way to have your cake and eat it too. I have been soaking my grains, like flour, before I cook with them and it makes whole grains taste light and delicious. Soaking (or fermenting) has been a huge revelation in our kitchen. Also, substituting maple syrup for sugar is a delicious alternative. Then, add enough salt to a sweet recipe to balance out the flavor, and you have something wonderful and nutritious. Soaking your grains before you cook or bake with them makes them much easier for your body to digest. As we know, whole grains are better for us than processed grains. Whole wheat and other grains still have the nutritious bran and germ, while white flour, white rice and other processed grains are stripped of these. Whole grains are hard for the body to digest though. Whole grains contain phytic acid in the bran. This combined with other minerals make whole grains more difficult for your body to digest. By soaking your grains in an acid medium, such as yogurt, buttermilk or watered-down lemon juice, the phytic acid is neutralized. Soaking also helps to break down complex starches and proteins, including gluten. People with gluten sensitivity or allergies may find that soaking grains makes gluten tolerable or easier to digest. Another benefit of soaking your grains is that your baked goods will rise easier and the texture will be much lighter, than if you had used white flour. 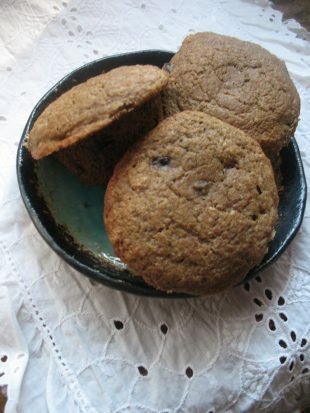 Following is a wonderful recipe for whole grain soaked muffins. The texture is light, not what you would expect from whole wheat, and the flavor is subtle and perfectly balanced. I like these muffins because they don’t knock you over with sweetness, but have just enough maple syrup to make them a treat. You can substitute chocolate chips and cherries for other berries or use none at all. They are delicious stripped down to a basic muffin, with nothing added. Mix flour and yogurt (or other acid) in large mixing bowl. Cover with a plate and let sit at room temperature for 24 hours. Mix wet ingredients together in separate bowl. Mix dry ingredients in separate bowl. Combine wet and dry ingredients with soaked flour. This will take a little elbow grease to mix. Pour into well oiled muffin tins and bake at 325 for 45 min. to an hour. Can’t wait to try this recipe! Thank you.